Sometimes a little can go a long way. Slim, small, and conservatively styled, the Studio makes short work of the commute and is perfect for the daily commuter who packs a laptop and important essentials. 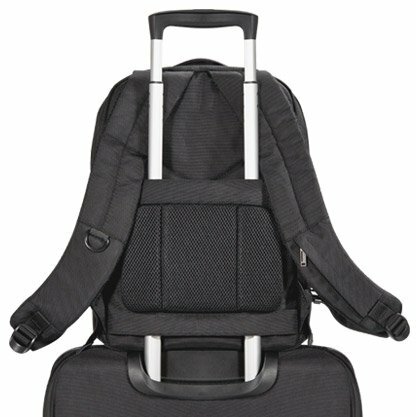 If you’re looking for a compact professional laptop backpack, look no further than the EVERKI Studio. With its slim profile, subtle styling and minimalistic appearance, it measures in at only 4.5 inches deep. The Studio’s compact design and expertly engineered interior hold the essentials you need for work or a short trip, so you’ll be able to pack your necessities and keep them neat and organized. The exterior of the bag is constructed with high quality materials, which make it durable enough to stand up to everyday use, while its size and discreet profile make it optimal for daily commuting by taxi or train. The Studio – small in size, big on function. 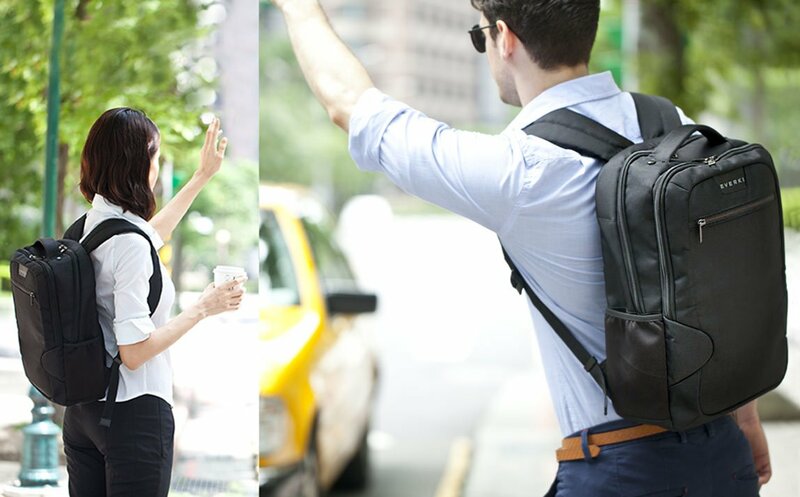 The lightweight Studio Laptop Backpack is smartly designed for today’s mobile manager or commuting professional. 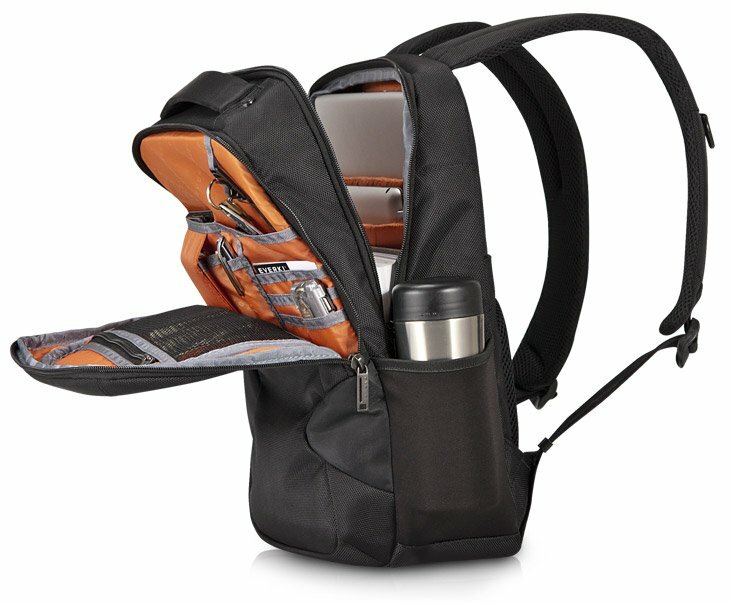 Its small frame efficiently carries daily essentials, like a 14.1-inch laptop or a MacBook Pro 15, as well as an iPad or tablet. And being organized is easy with the Studio, because all of the features are exactly where you’d expect them to be, along with some nice surprises too – like the stash pocket in the wide, ergonomic shoulder strap and the secret pocket hidden on the trolley handle pass-through. A pair of waist-level pockets keep water bottles close at hand; and you’ll also appreciate the pockets, pouches and slots for pens, business cards and phone. The Studio – understated organization. It’s critical to ensure that your laptop is safe, that’s why we’ve engineered the Studio with additional high-density padding stitched into the lining right where the laptop corners sit. The corner guard system will protect your laptop corners against knocks and bumps – or if you accidentally set your bag down too abruptly. The trolley handle pass-through on the back of the Studio allows you to double your efforts when carrying multiple bags, and there’s also a secret, hidden pocket for storing cash, passports or other valuables. Have you ever broken a zipper on your favorite bag? We have. That’s why we designed the Studio using durable zippers and metal pulls. So your favorite bag can remain your favorite bag. 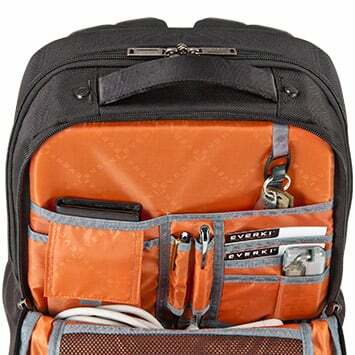 I'm a freelance AV tech and this has been the perfect bag for me to carry my macbook pro, ipad, assorted cables and adapaters, and plenty other little things I need while still being slim and compact. Also looks very sharp and high quality. I did have an issue after about 6 months of use but was quickly taken care of by Everki's excellent customer service. Will definitely buy another Everki product in the future! This is an incredibly well-made bag, equal in quality to any Tumi. First-rate materials and thoughtful, real-world design. Zippers are smooth, shoulder pads are comfortable and the interior is well-configured. Very little resistance encountered when pulling out the laptop due to the soft lining and brilliantly placed zipper tracks, which allow maximum access to each main compartment. Perfectly houses my 13" MBPro, iPad and Kindle PaperWhite, as well as a legion of cables and adapters. 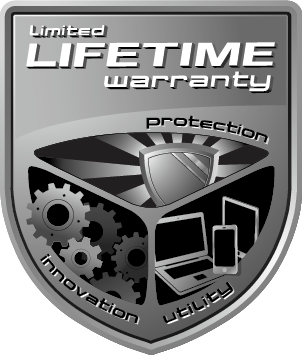 Lifetime warranty shows confidence in their product. Easy five-stars! Construction, materials, 'architecture', and looks all very good. Perfection would be reached if it could stand upright. 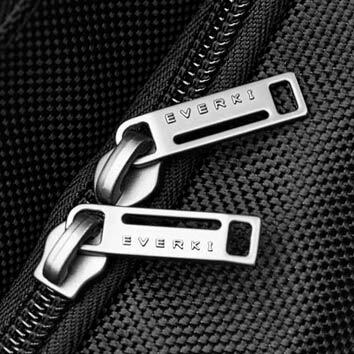 Its my first backpack from everki. really loved it and awesome small and fits a lot of stuff my MBP 13.3" and everything that i carry. light weight , comfortable. i really recommend it for everyone. This is a slick backpack. Ordering online I wasn't entirely sure how big it was going to be but thin was my objective and thin is what I got. It holds all of my commuter staples in a sleek design where everything I absolutely need has a place. The bag forces me to pick and choose what I carry keeping it light. Once packed with an ultrabook, external hard drives, power cables, phone chargers, etc, there isn't much room left over. ie. A sandwich would fit but not much else. 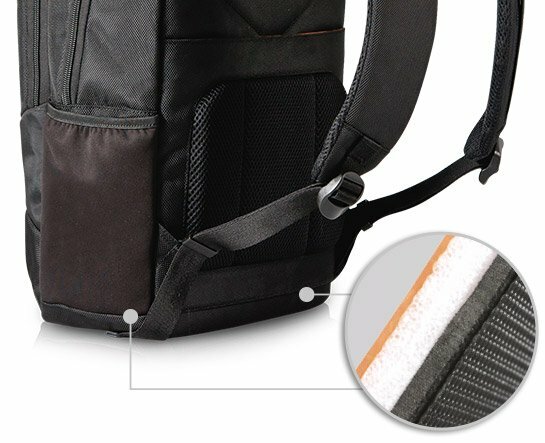 If you are looking for a precision backpack, this is it. Oh, and if someone thinks would like my backpack more than me, then a Tile fits nicely in the hidden stash pocket.